There is a legend around the Birman cat breed which tells of the Birman being raised by Kittah priests in their temple in Burma (now Myanmar). The temple had a golden statue of a goddess who presided over the passage of souls. The statue had sapphires for eyes. In this temple a hundred pure white cats lived and when a priest died, his soul would enter the body of one of the cats. When the cat died, the priest would be reborn. One of these cats was called Sinh, and he was the companion of the head priest, Mun-Ha. Mun-Ha was gravely injured in an attack on the temple and as he lay dying, Sinh leapt onto his body. Sinh stared at the statue and his coat took on the golden hues of the statue and the brown shades of the earth, only his paws that were touching his master remained white. His eyes turned sapphire blue. Sinh stayed on Mun-Ha's body for seven days, refusing to eat, until he himself died. Seven days later as the priests assembled to decide who would be Mun-Ha's successor, all the other temple cats walked in, all transformed as Sinh had been. They surrounded the youngest of the priests and he was declared the new head priest. The real history of how the Birman cat breed came to Europe is not quite clear. The most popular of two stories is that two Europeans, August Pavie and Major Gordon Russel were given two cats for saving a temple. The male cat died on their way to France, but the female called Sita, was pregnant and founded the breed in Europe. The time lines to this story do not make sense though. The two Europeans were in Asia in 1898 but the cats were only sent to France in 1919 - a time gap of two decades seems impossible. The other story says that two cats were stolen and given to an American millionaire who then passed them on to Mme Thadde Hadisch. Again, the male died and the female named Sita gave birth to kittens after arriving in France in 1920. All that is really certain is that a cat breed named Sacre de Birmanie (the Sacred Cat of Burma) was registered in France in 1925. The breed almost died out during World War II but fortunately outcrossing to appropriate breeds was undertaken and during the 1960's the breed was accepted on both sides of the Atlantic. The Birman cat breed is a medium to large sized cat with a stocky build. It has distinctive white gloves on the feet and the back feet have laces extending halfway up the back leg. This gorgeous cat’s coat is longhaired and pointed and is soft and silky. The thickness of the coat varies from season to season. The coat does not mat, but it still needs regular care to ensure that it remains tangle-free and silky. The ears of the Birman cat breed are almost as wide as they are tall and the eyes are medium to large and round. The tail is in balance with the body which is long and sturdy. The legs are well muscled and in proportion with the body. 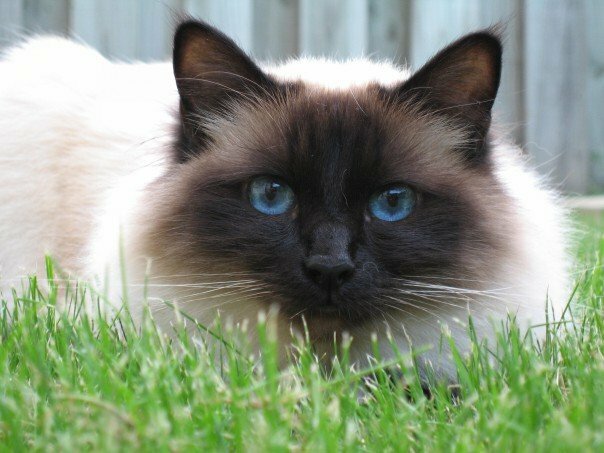 The Birman makes a perfect family pet that gets along well with children and other pets and they are just as happy in a single cat/pet household. 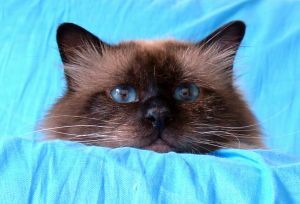 The beautiful Birman is talkative when people respond to the meowing and cooing sounds it makes, but if you do not respond, the cat will soon stop talking to you. This cat is an active and playful cat that needs lots of stimulation through games in order not to become bored. The Birman makes a great lap cat as it loves to snuggle on your lap for a mutual cuddle. 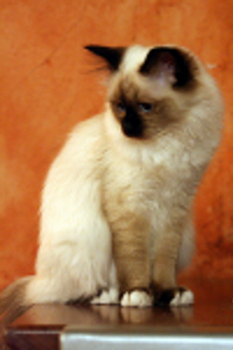 The Birman cat breed is fairly healthy and there are no major hereditary disorders. Speak to the breeders as they should also be able to inform you of any health issues that they have come across. 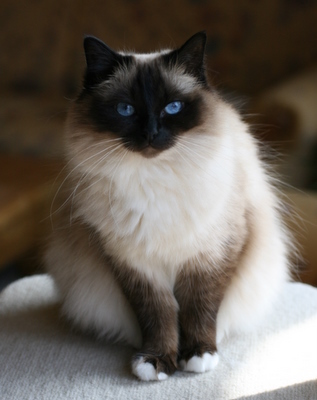 Do you have a story about your Birman cat that you would like other cat lovers to hear about? My cat just had her 3rd birthday and we made cupcakes and my friends came over and we had a lot of fun!!! !